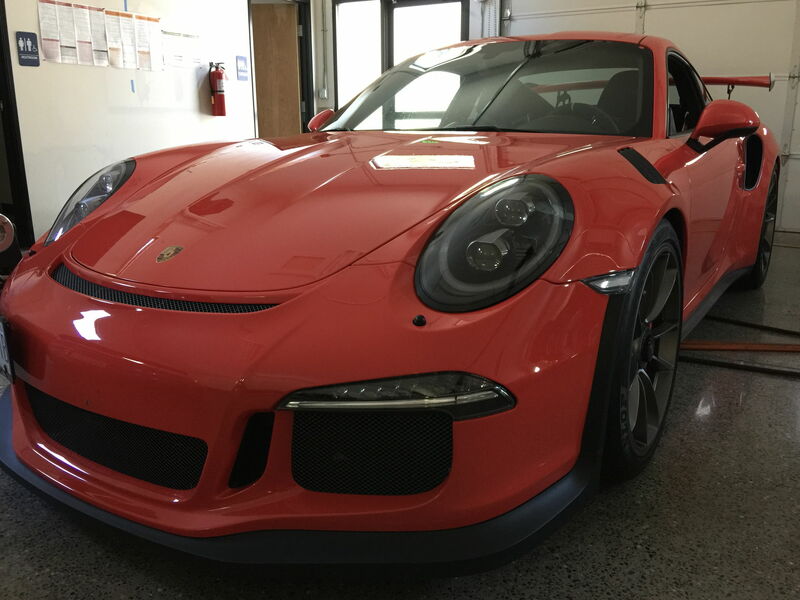 We recently had a US Spec 991 GT3RS in the shop and the owner was gracious enough to let us get a baseline on our dynapack hub dyno, test the catted system and install and test the race headers on his car. We've tested the 991 GT3RS previously on a friends DynoJet dyno in 40F ambient temps and saw the car made about 420-430 whp on that dyno. We hooked the RS up on the Dynapack, put the car into Rolling Road mode with the factory PIWIS2 computer (to allow the car to run in RWD only without pulling power) and starting warming her up. The first few pulls resulted in 396whp-400whp. Ambient temps were fine in the 50-60degree range. We logged Intake air temps and they started at 95-100F and came down to around 80-85F by the end of the pull. The slightly elevated air intake temps should have resulted in a 4-5whp loss due to air density changes. So we started digging a little deeper. We decided to pull the air ducts out and connect them so the air ducts face the ground and have the fans blowing directly into them pulling colder outside air directly into them. Dundon GT3RS Testing: Intake temps at 85-95F vs intake temps at 65F, same car, stock exhaust. The car gained 20+whp and 20+ftlbs almost everywhere with cooler intake air, vs 80-90F intake air. As I said the air density differences between 85-95F (0.07157 lb/ft3) air and 65F air (0.07540 lb/ft3) air is only about 5%. We also noticed the car wasn't adding any fuel like a 997 GT3RS does when the intake temps start to rise a bit, it actually limits cylinder pressure/torque. We talked to a source at Bosch about this and were told that it's a purely emissions based response. In order to limit emissions Porsche® isn't adding fuel as the intake temps increase, but rather they're limiting torque output. Below is a comparison of the 991 GT3RS with Dundon Race with 65F IAT's vs Stock at 85-90F. The ambient temps of the dyno and correction factors are the same for the 2 runs, so if someone was busy or just didn't care to look at the intake air temps, they would make the conclusion that Dundon Race headers make 50whp. This is highly misleading as the car is limiting torque output for the stock run (possibly unbeknownst to the dyno tech) and not for the Race Header run. In our opinion, this is the proper way to report it, where the conditions are as matched as possible between the runs, even though it makes the gains lower. The 991 GT3RS is a sophisticated monster governed first by emissions and second by performance. Knowing this helps us to understand a little better the performance of these awesome cars!